Sunshine‘s status as the oddball in Mario‘s lineup makes it a perfect representation of the GameCube. The system was not only a commercial failure, but also a weird way to look at Nintendo’s series. Most of the games it got defy conventions, not necessarily in good ways, but certainly in notable ones. Look at how the system launched: rather than start off with a Mario platformer, like the previous consoles did, it went with Luigi’s Mansion, a slow-paced, compact exploration title that bears more resemblance to old point-and-click PC games than to the older brother’s jumping. Sunshine stuck the FLUDD on Mario’s back. Link got turned into a cat-eyed cartoon. Mario Kart got a two-player per kart mechanic (which is also the GameCube era experiment that most deserves to return). Donkey Kong forced players to attach some fake drums to their console. Kirby raced on Warp Stars rather than get his promised plaformer. But some of these weird takes are also ones that really made the GameCube stand out. Metroid felt surprisingly at home by slipping into the shoes of a 1st-person shooter. Super Smash Bros. Melee‘s high level of technique has made it endure to this day as a competitive title. And Paper Mario hit not only peak weirdness in Thousand-Year Door, but also its greatest point of quality. It feels like Nintendo, when their back is at the wall financially, starts letting the rules fall out the window. And maybe that’s why the Cube, despite its failures, is so beloved by many fans. It could be a unique take on a well-known franchise or maybe one of the Cube’s weirder new series that only showed its face on the little purple box (RIP Baten Kaitos) but there always seems to be some love for something on it. 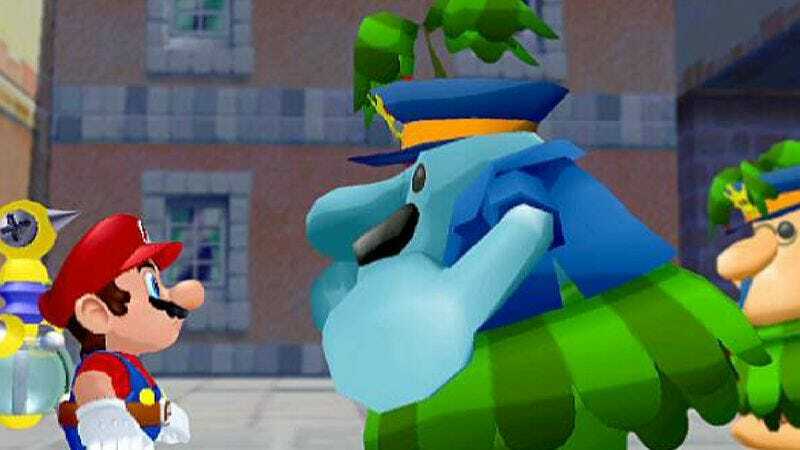 Personally, I’d rather have a weird Mario game with bizarre voiced cutscenes and shadow-dimension kangaroo courts than the sterile business of Super Mario 3D Land. One of the things I liked the most about Sunshine was the fact that every level felt like a distinct part of the world: There’s a cozy rustic hamlet in the hills, a thriving industrial center with an underground racing scene, an amusement park, a mountaintop village with its own annual festival, etc. The fact that most of the Shine Sprites are awarded after an explanation by the locals makes the whole thing feel like a place that will go on without Mario when his vacation’s over. I can’t say the same about Shifting Sand Land or Tiny Huge Island. Maybe that’s not what Mario should be about, but I much prefer world-building informed by world design than a bunch of disparate, if well crafted, worlds with no relation to each other. I think Miyamoto is just flat-out wrong in his near-contempt for narrative. Yeah, long-winded, densely packed cutscenes are never the best option for a game, but if the choice is between “no story” and “some story” I’m always going to go for the narrative option. I want context. I want to see developers express their creativity not just through mechanics but in the context in which they place those mechanics. I’ve been playing Final Fantasy XII: The Zodiac Age recently, and that game’s narrative—and more importantly, its whole approach to the world and the characters’ place in it—inform many of its pleasures. You aren’t just going around farming monsters for skill points and drops, even though that’s what you spend 80 percent of your time doing. You are uniting a bored foodie with a daring chef and her fish bone-infused cuisine. You are piecing together a story of a war between the gods and their most powerful creations. You are on an adventure for God’s sake! From Final Fantasy to Overwatch to Dark Souls, narrative takes many forms and attempts to do many things, but the one thing it does not do is create an inherent impediment to enjoying a game. I’m much more amenable to the no-narrative approach than most, though I love a good story. Much of it, for me, comes down to what the game is trying to do. In something like a Mario game or Donkey Kong game, movement and exploration are the key factors. If narrative comes between the player and those elements, either through slowing down the game flow or through muddling the characters, that narrative should be dialed back. I narrowly preferred Super Mario 3D World to the Super Mario Galaxy games at least partially for this reason. On the other hand, in a Final Fantasy or Metroid, the narrative can be critical to establishing the elements that pull you in—atmosphere, direction, and purpose. Zelda seems like a key franchise that could go either way. I’m not typically interested in a Zelda game being narrative-heavy in the way that I like a JRPG to be narrative-heavy, but there needs to be enough character and atmosphere in the world that finding new places and helping strangers becomes a compelling goal in its own right. The mechanics, particularly puzzle-solving and swordplay, make up the bulk of what pulls the player in, but nobody would actually enjoy slashing at moblins for 20 hours without that task being broken up with some zany characters or story vignettes. What worked for the more bare-bones original Legend Of Zelda barely held up in its direct sequel and certainly wouldn’t work with a lengthy modern Zelda game. I’m of the opinion that Breath Of The Wild hit the sweet spot, and that Twilight Princess and Skyward Sword, while excellent games, had threatened to become too narrative-oriented. It’s a fine line. Can we please get into yoshi’s role in this game? Because I am pretty sure I correctly remember that when you rode a yoshi, you could force him or her to violently regurgitate a stream of partially digested fruit juice at enemies. Complete with a really upsetting gargling noise. Also, you were rewarded for eating birds. Not bad, dangerous, enemy birds. Just the colorful, cute little songbirds native to the island. You could hunt them down and eat them, and get coins for it. What was up with that? That’ll do it for this week, Gameologinauts. As always, thank you so much for reading and commenting. We’ll see you all again next week!